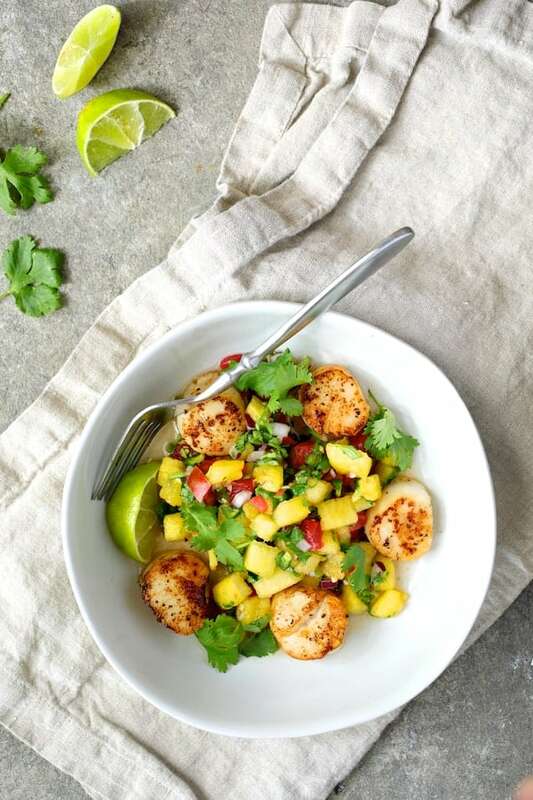 Pan Seared Sea Scallops with Watermelon Tomato Salsa is the perfect summer meal that requires little to no cooking and it’s ready in under 30 minutes! It’s also Progressive Eats time where we’re celebrating watermelon! Scroll down to click to more amazing watermelon recipes! You probably took one look at the photo and wondered why I’m trying to pass off pineapple as watermelon. Well, I had intended to purchase a plain old deep pink Southern summertime watermelon for these pan seared sea scallops and I thought I had. However, when I cut into the watermelon to make this salsa, it was bright yellow on the inside and here’s the proof! No, not one of the more perfect watermelons on the inside either, but things do not always go smoothly in Foodbloggerville and I wasn’t about to throw it out. So, I just rolled with it. Actually, I’m glad I did. It was incredibly sweet! Evidently that cracking helps concentrate the flavor in the rest of the melon. Here’s more information on yellow watermelons: What is Yellow Watermelon and How is it Different From Red Watermelon. 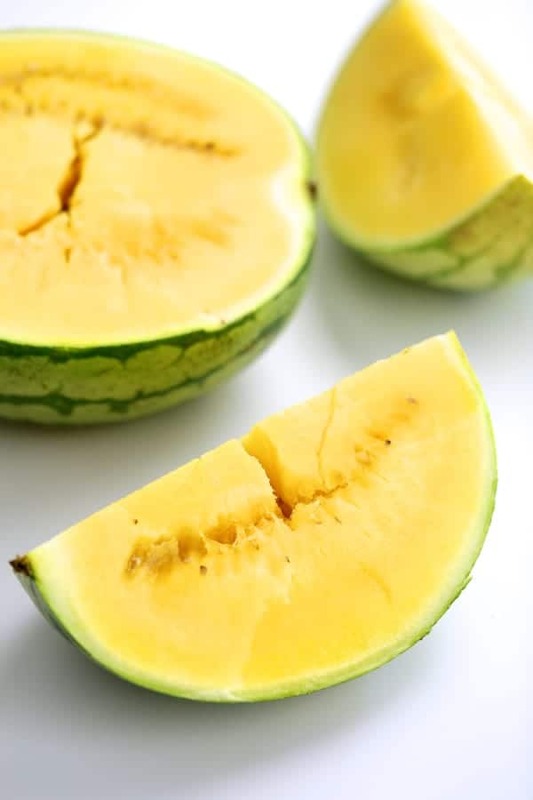 While red watermelon is high in lycopene, yellow watermelon is high in beta-carotene. The flavor is sweeter than red and I definitely detected the notes of honey and apricot in the flesh which yellow watermelon is touted to have. I researched why the watermelon cracked on the inside. It was simply due to uneven or excessive watering while the fruit was ripening. There’s a lot of silly information out there about cracked watermelons; I’m not going to go there. I’m so excited to have discovered yellow watermelon because it’s delicious! …And this watermelon-tomato salsa with the pan seared sea scallops… Oh, yeah! A simply-seared sea scallop is a thing of beauty. Sea scallops take only minutes to cook which makes them perfect for an easy dinner yet elegant enough for guests! Difference between sea and bay scallops: Sea scallops are large (think of the large, wide open sea). Bay scallops are small (think of a small bay looking out into the sea). 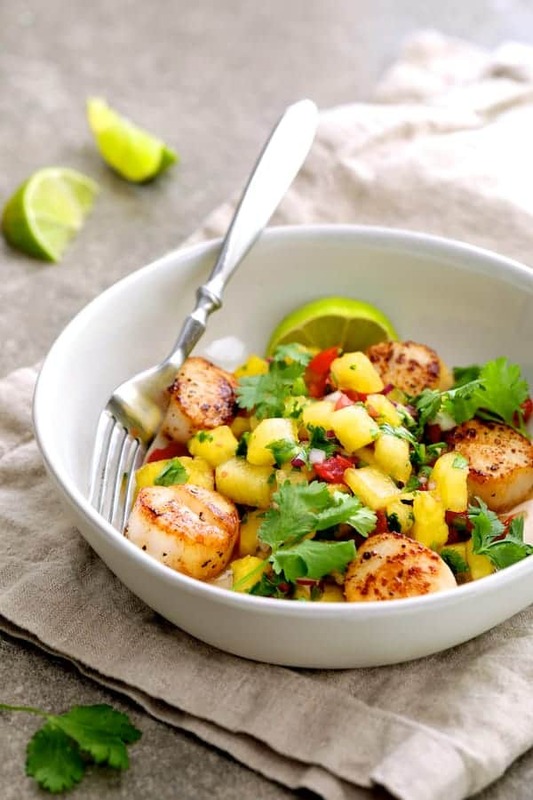 Make sure the scallops you purchase do not have ANY additives. Sometimes they’re treated with chemicals to keep them white. Just say no! Rinse them quickly, remove the beards (a noticeable muscle on the side of the scallop) and pat dry. Season the scallops with a little salt and black pepper, heat some butter and olive oil and sear away! Two to three minutes on one side and one to two on the other and that’s it! 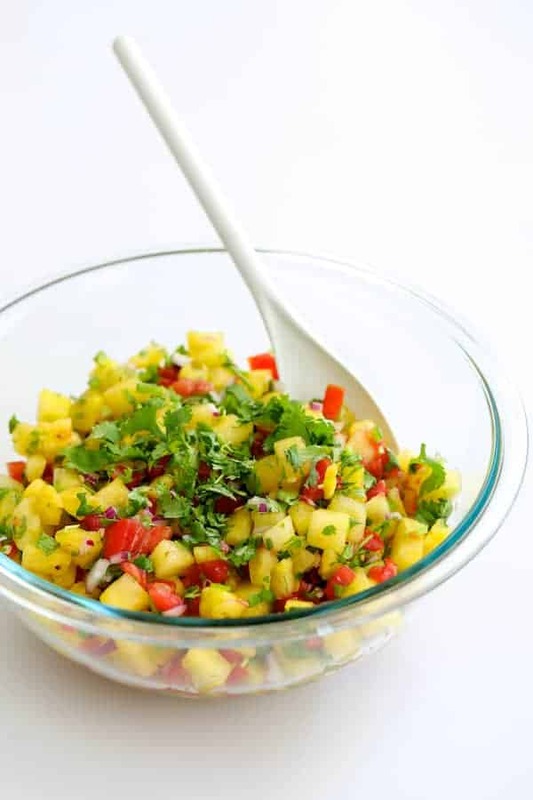 Serve with this easy, fresh salsa and you’ve got a lovely, summery dish! Watermelon, tomato, fresh chile, red onion, cilantro, fresh lime juice and a touch of honey! Pan Seared Sea Scallops with Watermelon Tomato Salsa is beautiful, summery perfection! Welcome to Progressive Eats, our virtual version of a Progressive Dinner Party. Each recipe in our menu this month features something made with a summer favorite: Watermelon! Our host this month is… Hey, it’s ME! 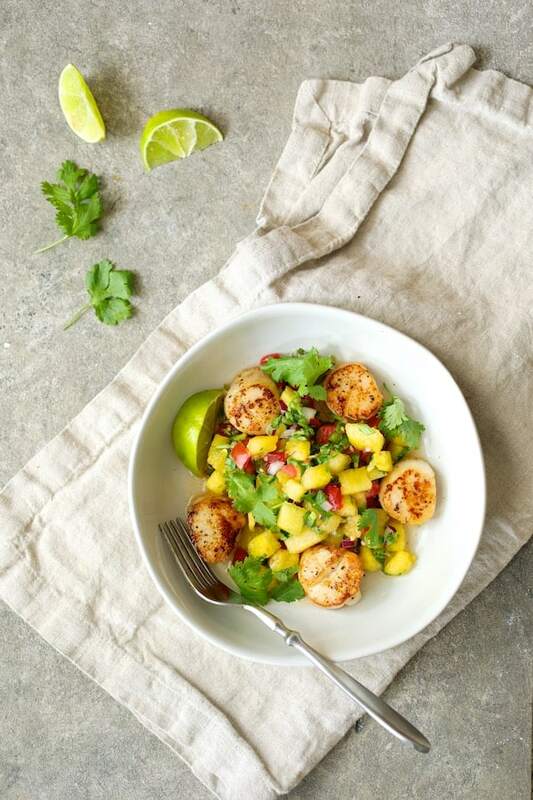 Pan-Seared Sea Scallops with Watermelon – Tomato Salsa – You’re Here! Pan-Seared Sea Scallops with Watermelon-Tomato Salsa is the perfect summer meal that requires little to no cooking and it's ready in under 30 minutes! SALSA: Combine salsa ingredients except salt in a large bowl. Set aside or refrigerate. 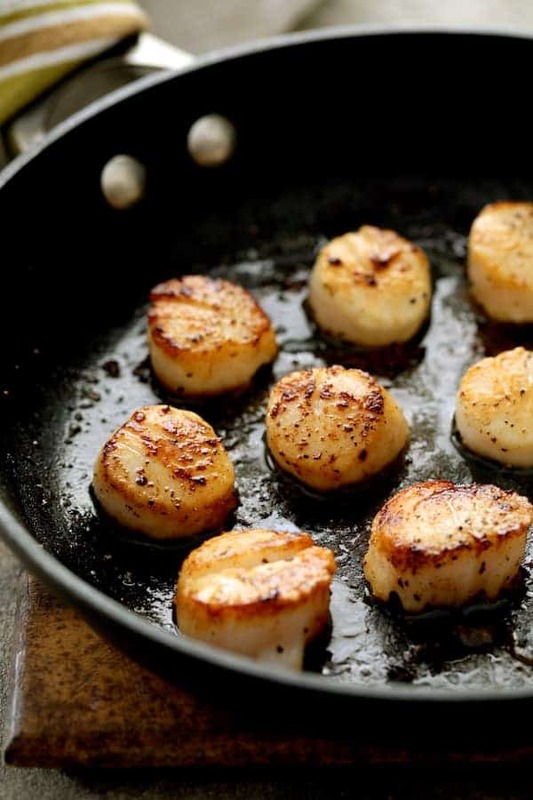 SCALLOPS: Heat butter and olive oil over medium-high heat in a large nonstick skillet or saute pan. Season scallops with salt and black pepper. Place half the scallops in the pan and sear 2-3 minutes per side. Flip and sear another 1-2 minutes per side. Repeat with remaining scallops, refreshing oil if needed. Add salt to salsa right before serving. 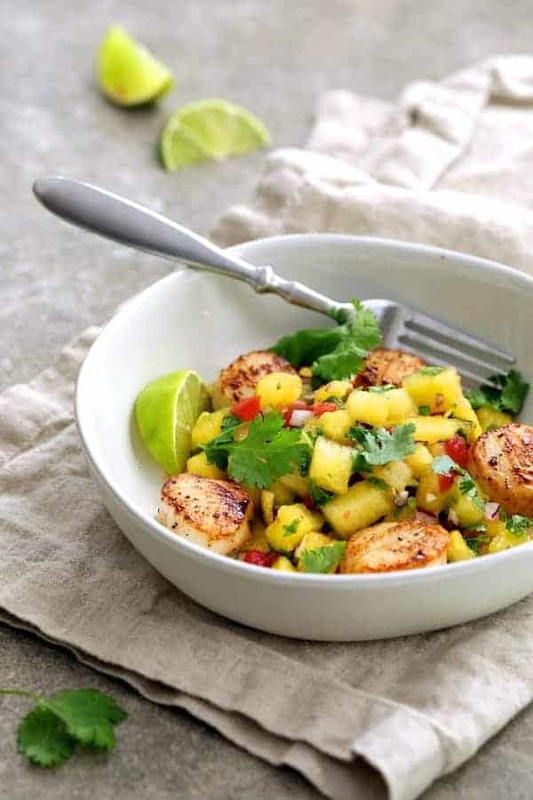 Serve salsa with scallops. You don't want to add salt too soon to the salsa as it will get watery too quickly. Add it right before serving. Previous Post: « Taste Matters – Live Abundantly! Thanks so much for hosting this month! I am on the hunt now for yellow watermelon. I’ve never heard of it! And what a beautiful pairing with simply seared scallops. I get scallops from a nearby vendor who has fresh seafood flown in, and I always just sear them with simple seasoning like you. Now I have a great salsa recipe to go with them!! Thanks, Susan! The yellow watermelons are really lovely! So glad I came across them! I have never seen or heard of a yellow watermelon Carol but it was meant to be, your salsa not only sounds fantastic but has beautiful color to boot! Ever since I saw the list with the scallops and watermelon combo I knew it would be one that would make my heart sing. Thank you, Barb! I had never heard of yellow watermelon before either so was pretty surprised when I cut into the watermelon. Thanks again! Oh yes!! I adore sea scallops and we’re on the same page when it comes to loving the watermelon/sea scallop pairing. I’ve never had yellow watermelon though, so I need to find one and learn first-hand how sweet it is. Oh gawd those scallops in the pan look so succulent! And what a happy accident to get a yellow watermelon! I’m going to have to hunt one down! 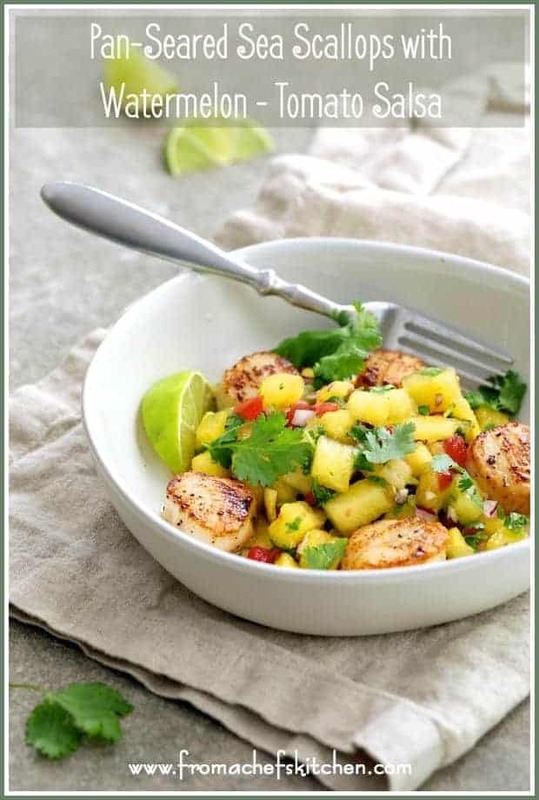 I adore scallops and they sound amazing paired with your beautiful salsa! I’d eat it will any color of watermelon. Thanks for hosting us this month!